Lighting plays a huge role in decorating and making a space uniquely your own. When it comes to home furnishings, the right lighting acts as the finishing touches on a room, so it is important to understand how to use lights to your advantage. Floor lamps, table lamps, and sconces are essential in any beautifully decorated home. When used correctly, lighting is both practical and decorative. Lamps and other lights can be arranged to draw attention to specific areas. A favorite vintage arm chair may appear drab and colorless without proper lighting, whereas the right illumination from either overhead or floor lamp can bring out the piece's antique detailing or eye-popping shade. Use the following lighting tips for the office, bedroom, and more to select the pieces that'll work perfectly with your decorating style. To set the best atmosphere in your space, you'll want to incorporate three different kinds of lights at different heights. These include overhead, task, and accent lighting. Built-in or pendant overhead selections usually have the biggest effect on the overall brightness of rooms. Many have dimmer options as well, allowing you to alter the amount of light and set the mood. To set the best atmosphere in your space, you'll want to incorporate three different kinds of lights at different heights. Rather than hanging from the ceiling, task and accent lighting sits lower to the ground at the level of your couch, chair, or bed. Task lighting should be used in confined areas, such as offices and studies, to provide strong, directional light for reading or work. Accent lights heighten the appearance of decor, artwork, and rich interior details by creating a soft, warm glow. Each type of lighting serves a specific purpose, though none is more or less important than the others. Since most rooms require different levels of lighting, many floor lamps are adjustable. Pieces can point up to the ceiling to brighten large sections of a room or turn downward to fill a small, private area with light. Floor lamps brighten up centerpiece sofas or provide concentrated lighting to isolated reading nooks. This lighting strategy works best tucked in living room corners or beside seating to evenly distribute light around frequently used spots. Because of their height, floor lamps are a great way to add height and dimension to your interior design by drawing the eye up along their vertical line. Perfect for bedroom nightstands, console tables or home office desks, table lamps offer soft, subtle lighting that creates a comfortable glow rather than a harsh glare. Using different lamp shades allows you to adjust the amount and type of light given off. 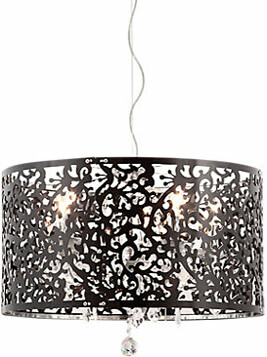 Dark shades create a warm and relaxed mood, while thin or light-colored covers give off fresh, vibrant radiance. For added style, shades in a variety of shapes, patterns, and materials are available to suit any decor scheme from rustic to eclectic. Overhead fixtures, such as recessed lights, pendants, sconces, chandeliers, and spotlights, are ceiling based broad and wide-ranging lighting options. These pieces are used to provide a general brightness to large spaces. Dining rooms and entryways benefit most from overhead lights since no particular area needs more light than another, but we find them working well in living rooms, bedrooms, hallways and even grander bathrooms as well. 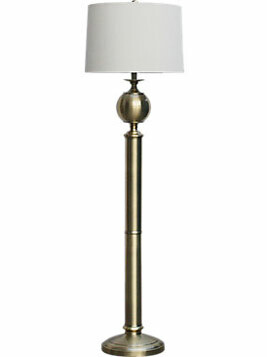 Popular classic lighting styles include floor lamps with gold, bronze, or translucent stems. Neutral-colored models with a hint of luster can offer traditional, rustic, or vintage appeal. 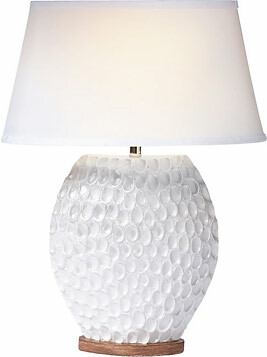 Classic table lamps are often embellished and feature shaped bodies, including round or urn-like bases. Fit these pieces into your living room or office decor for a refined yet tasteful accent. Modern decor benefits from table and floor lamps with clean lines and minimal adornments. Opt for neutral colors, such as black, silver, or steel, for these contemporary pieces. Cylindrical or rectangular overhead pendants also work well in modern or minimal spaces, especially over dining room counters or in entertainment rooms. 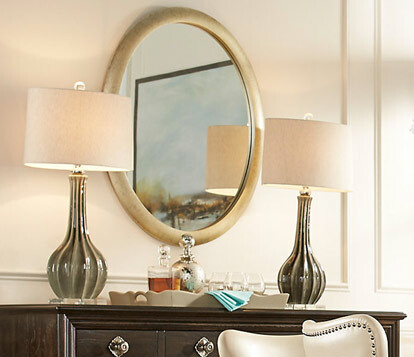 Finally, transitional lighting fixtures combine the timeless style of traditional design with contemporary flair. Floor lamps and overhead lights often have clean lines with complex embellishments. Chandeliers and sconces are perfect for entryways and living rooms with transitional themes as these pieces can add luxury and boldness or toned-down simplicity depending on their design. Decorating with lighting is not only essential for a well-lit and functional space, it is also great for accessorizing your beautiful home. To take full advantage of well-placed lighting, utilize mirrors and windows as well. 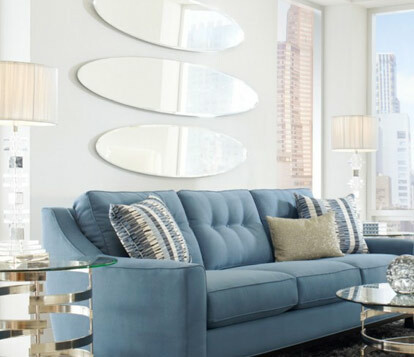 Mirrors reflect light and increase the brightness of a space, while thin curtains and glass-paneled doors allow natural sunlight to radiate inside. Once you begin to play with adding and restricting light, the home decor possibilities are endless. Keep these lighting tips for the living room and beyond in mind, and let your own decorating brilliance shine through.